The Pit-Skalper is based on the proven technology and performance of the Skalper, which is used throughout the world in the harshest environments. This new design is specifically geared to handle the needs of aggregate, ready mix, portable crushing and screening plants, sand, gravel, asphalt, and recycling, while providing excellent cleaning to remove carryback from the conveyor belt. The Pit-Skalper uses the same patented E-Z Torque tensioner as the rest of the Skalper line, featuring a stainless steel spring, allowing the blades to self-adjust throughout the entire life of the blade, making it robust and accurate. The tensioner and mounting tube are zinc plated for corrosion resistance and the blades can be quickly changed from one side of the conveyor belt. 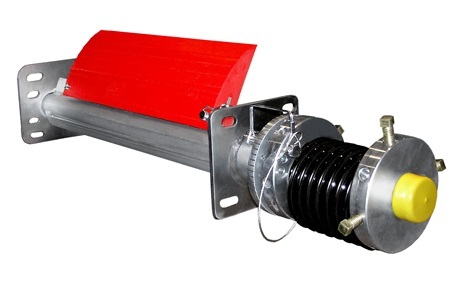 The Pit-Skalper can be installed on any belt with maximum blade speeds of 600 ft/sec and a pulley diameter of 10-20 in.